Andersen’s selection of Happy Feet™ mats combine exceptional anti-fatigue performance with unique safety features. Most industrial anti-fatigue mats have exposed foam which soaks up water, greases and oils, and should only be used in dry areas. Happy Feet mats feature a dense rubber cushion encapsulated within solid, nitrile rubber to protect against deterioration and contamination. This construction makes Happy Feet mats highly resistant to chemicals, animal fats and petroleum products. Happy Feet mats are also heel – resistant, so wear whatever shoes you like. These advantages result in more comfortable, better wearing, longer lasting mats. Happy Feet mats are static-dissipative and safe for use in computer rooms and electrical part manufacturers. Happy Feet mats are versatile and may be used in production lines or any industrial and commercial anti-fatigue environments. 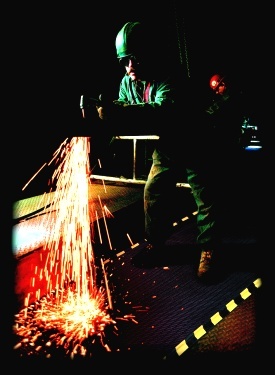 These anti-fatigue mats have nitrile rubber gripper backs to minimize mat movement and maximize safety. For added safety, the mats can help designate sensitive areas with OSHA color-coded borders; green for safety, orange for warning, red for danger, and yellow for caution. Solid black borders are also available. Low profile and beveled borders for added safety. For continuous length applications, choose Happy Feet Linkable. Each 3’x5′ section is available with either one or two ends. Connecting multiple sections creates a versatile, continuous anti-fatigue system that stays where you put it. With Happy-Feet Linkable, there’s no need to handle large, heavy, cumbersome rolls- and no need to replace an entire roll if a single area becomes damaged or worn. Happy Feet Linkable mats are ideal for assembly line applications. Texture-Surface: for dry to damp work areas where traction is not critical. Easy-to-clean surface. Grip-Surface: for wet work stations where maximum traction and/or scraping is crucial.